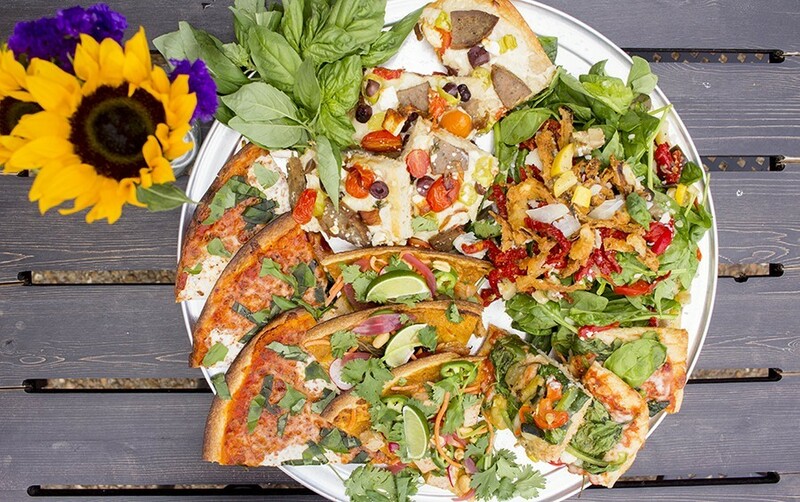 Humble Pie offers creative pizza. 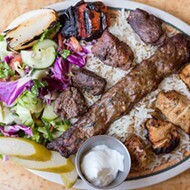 9783 Clayton Road, Ladue; 314-997-7070. Mon.-Sun. 4-9 p.m. There are two sides to Humble Pie. Literally. The first greets you immediately upon pulling off Clayton Road and into a strip mall parking lot. There, the façade of a quaint, Tudor-style cottage emblazoned with the restaurant's logo beckons, along with wrought-iron outdoor tables topped with fresh-cut flowers. Planters overflowing with peppers and tomatoes decorate the patio, and window boxes spilling fresh herbs over their sides line both sides of what looks to be the front door. 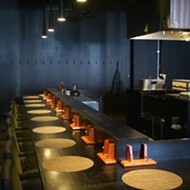 Don't bother pushing on it, though, for this charming scene turns out to be merely a stage, not the actual restaurant. The real action takes place just around the corner. Instead of pushing through those faux front doors that face the parking lot, guests must walk around the side of the building and through an alleyway, a quirky setup that's a vestige of the building's last occupant, Red-L Pizza. There, the doorway opens to a vestibule not much larger than an airplane bathroom. A small order counter and a soda cooler take up the entirety of the real estate. The only area to dine in, as it turns out, is on that patio, or standing up next to a ledge in the alley. That only looks like an entrance. But it is a great place to enjoy a slice or two outside. Contrasted with the initial impression, the scene here is darker and slightly clandestine. It gives Humble Pie a sort of speakeasy feel, which would be fun for the right audience. 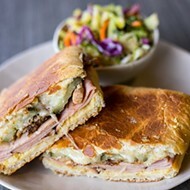 In the heart of Ladue, though, it's more of a gamble, requiring a bold restaurateur to embrace such a challenging setup. Fortunately for Humble Pie, it has two of them — Jess and Mark Lucas, who took over the former Red-L space this past December. 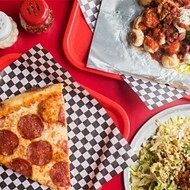 The husband and wife team has enjoyed national acclaim for their beloved lunch counter, Fozzie's Sandwich Emporium, and decided to try their hand at pizza after being approached by Red-L's co-owner John Rice, last year. Though the timing wasn't quite right for the Lucases, they couldn't help but be intrigued by the idea, especially considering that Mark Lucas got his start in high school at a pizzeria. Mark Lucas has come a long way since his days slinging pies as a teenager. He's graduated from culinary school, worked at an impressive array of upscale restaurants around town and even counts a Michelin-starred restaurant in Belgium as a former employer. The real entrance is through the alley. And now he can add to that roster Humble Pie, which is a welcome addition to St. Louis' expansive pizza scene. As at Fozzie's, he's taken his background and applied it to a more casual model without dumbing things down. All doughs are made in-house in a climate-controlled dough room, ingredients are sourced locally and sauces are made from scratch, just as you'd expect from a more formal, sit-down operation. The Lucases toiled for months trying to perfect their dough recipe, and their efforts result in two pizza styles that are as different as the two sides of the restaurant. The first is an ultra-thin, round-shaped crust that makes Imo's look hefty; the second is a thick, rectangular Sicilian-influenced "Detroit-style" pie akin to focaccia. Both styles are available as the base of a variety of signature pizzas. "The Humble Margherita" comes with organic house red sauce, fresh mozzarella, fresh basil, an olive-oil drizzle and pink Himalayan salt. Different pizzas work better with different crusts, including the Margherita, a traditional preparation of San Marzano tomato sauce, fresh mozzarella and basil. 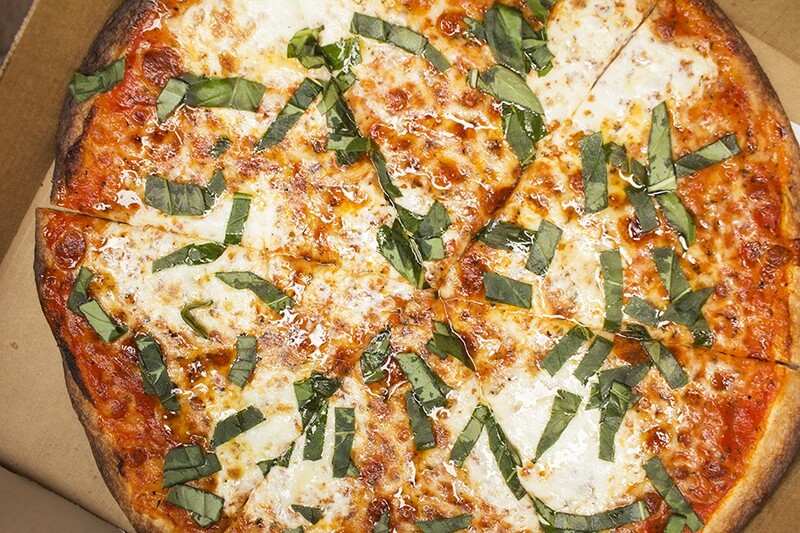 When served Detroit-style, the Margherita is a delight, its focaccia-like crust serving as a delectable sponge for soaking up the bright sauce and molten cheese. On a thin crust, however, the same toppings came across as salty and muddled. The thin crust worked well for the "BRIEzy," though, a fruit-forward pie that pairs Granny Smith apples with dates and a drizzle of fig balsamic. Rich Brie cheese gives the pizza an earthy funk, and fresh arugula, garnished after the pie comes out of the oven, infuses it with pepper. It's a lovely pairing of sweet and savory that evokes brie baked en croute. I expected the thin crust to be too fragile for the "Brussels on My Mind," but I was pleasantly surprised by how well it held up to the generous topping of shaved Brussels sprouts, bell peppers, onions and bacon. Smoked mozzarella infused the pizza's tomato sauce base with deep flavor. 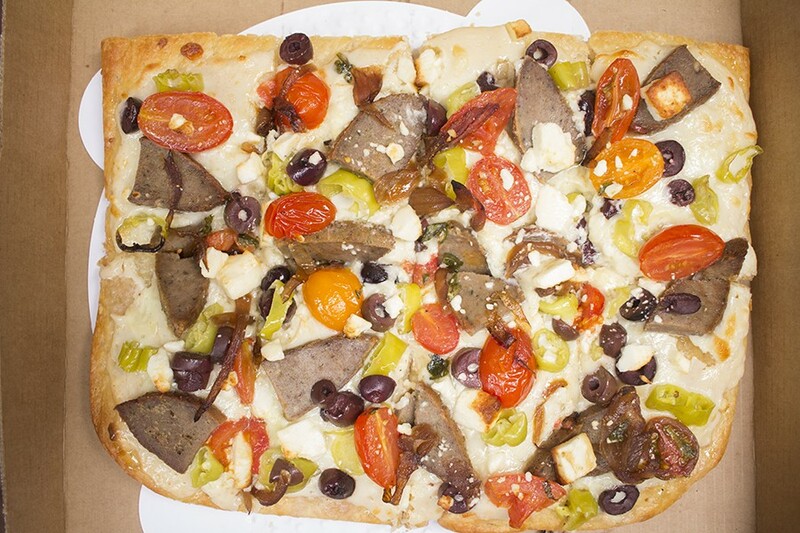 "The Hercules": gyro meat, sweet onions, feta, tomatoes, Kalamata olives, pepperoncini and humble sauce. I opted for the thick crust on the "Hercules," a Greek-inspired pie topped with gyro meat, feta, tomatoes, olive and pepperoncini. It was pleasant enough, if a bit dry, but the sugary-sweet onions made an odd contrast. I found this sweet-savory play equally off-putting on the restaurant's "garlic fingers" — basically a thin-crust, sauce-free cheese pizza that tastes like it's been drizzled with simple syrup. Humble Pie's "Meazza" works well on the thicker crust, the extra heft serving as a firmer base for the carnivorous feast of Polish sausage, meatballs, pepperoni, ham and bacon. Though the description suggests you'll be clutching your heart after eating this monster pie, it wasn't at all greasy or overwhelming. Dare I call it balanced? The smoky bacon, spicy pepperoni, garlicky sausage and umami-filled meatballs somehow didn't overwhelm — instead, each offered a subtle flavor difference that made this an enjoyable experience. I was equally impressed with the "Fundido," a play on the Tex-Mex queso dip staple. Again, I selected the thicker crust and was pleased with the results. Meatballs and spicy cheese sauce are balanced with fresh spinach, large slices of fennel and red onions, and marinated tomatoes. Again, for a dish that could have gone heavy, the addition of these fresh ingredients made for a surprisingly lighter-feeling meat option — a good thing considering I couldn't stop at one slice. The Vegan Banh Mi is topped coconut-Sriracha braised organic tofu. 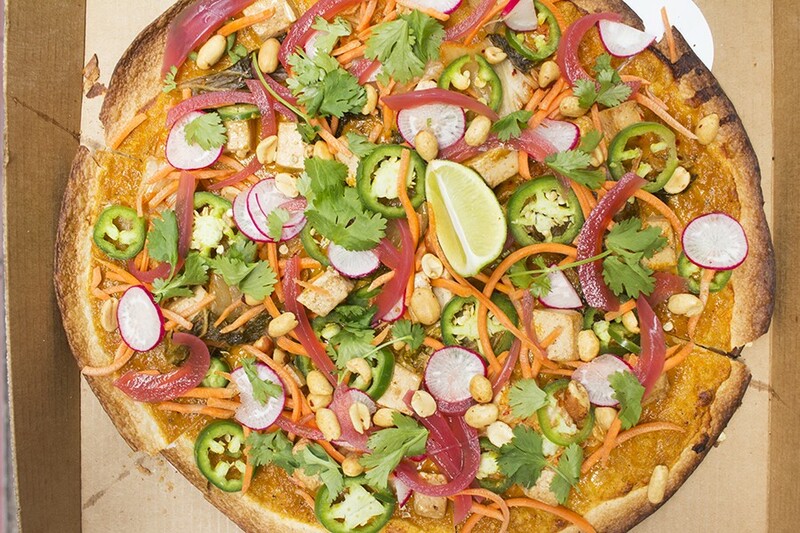 Humble Pie's "Vegan Bánh Mì" pizza pulled me out of this meaty bliss. 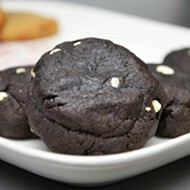 This is the one offering where I'd suggest the thin crust, so as to mimic the crunch of crusty Vietnamese bread. Prepared in that style, it is shocking how much this tastes like an actual bánh mì, and a well-prepared one at that. 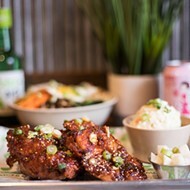 Coconut and sriracha-braised tofu, kimchi, jalapeno slices and coconut-mango sriracha sauce bring a searing heat, though pickled red onions, cilantro, carrots and radish provide some cooling relief. Coupled with the salty crunch of peanuts, the flavors are so powerful, you can't stop enjoying this one, even as beads of sweat form on your brow. 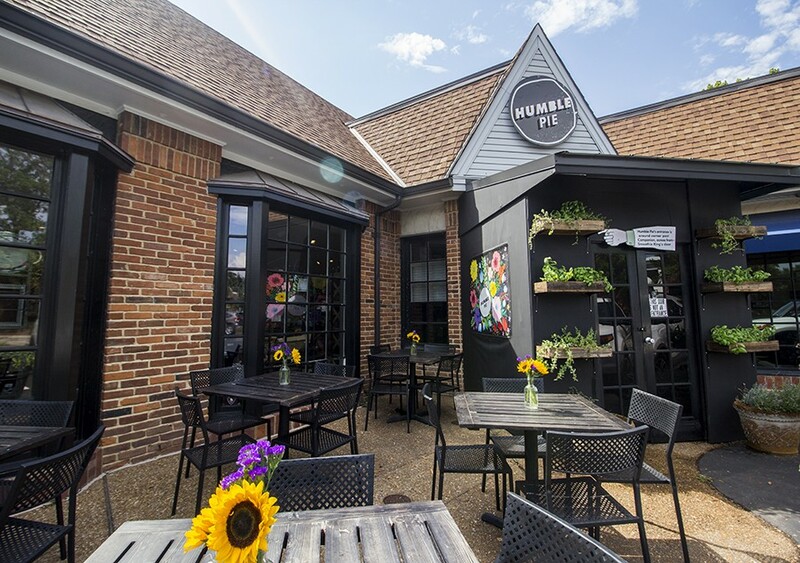 Though Humble Pie's menu is anchored by its pizzas, the restaurant offers a handful of appetizers, including outstanding beef meatballs served in tangy red sauce, as well as several salad choices. Having never had a Redel's "Famous Chopped Salad," I found the mélange of diced cauliflower, green peppers, carrots, chicken, hard-boiled egg and dill dressing to be the sort of chicken salad you'd find in a 1970s cookbook. I assume loyalists of the long-shuttered DeBaliviere neighborhood restaurant that gives it its name will be satisfied. I preferred the ratatouille, which impressed with its mix of fresh and grilled vegetables, capped off with crispy fried onions, as did the "Herb-a-Voire," which married mixed greens with fresh-from-the-garden mint, cilantro, basil and parsley, as well as pumpkin, flax and sunflower seeds, and dried cherries. The layers of texture and herbaceous notes might make you think you are at a specialty salad shop rather than a takeout pizza spot. Pies, meant to serve one or two guests, are offered in flavors such as blueberry lemon and vegan Mexican chocolate. In keeping with the theme, Humble Pie serves a handful of individually-sized dessert pies. (The menu says they serve one to two people, but who is sharing?) These wonderful, flaky concoctions are the handiwork of Dottie Silverman and Jess Lucas, who operate under the name Dottie's Flour Shop. Options include an excellent blueberry and lemon hand pie, as well as Lucas' slightly spiced vegan Mexican chocolate, which will make you forget you've eschewed the dairy. 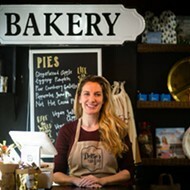 The pair are already selling their wares in a local coffee shop as well as at Humble Pie, and their talent for pastries suggests we will be hearing more from them in the future. 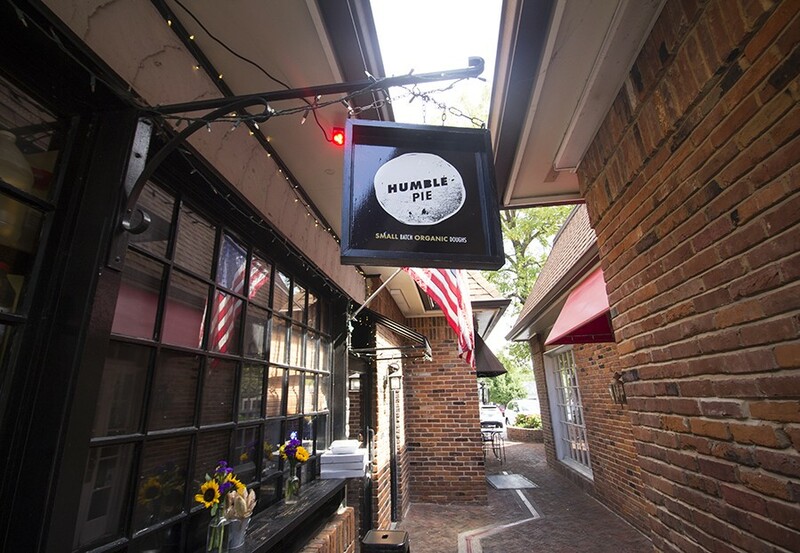 For now, though, Humble Pie is the place to taste their wares — even if it means a bit of a wait. Consciously bucking the recent fast-casual pizza trend, in which the goal has been to get folks fed (cheaply) within minutes, Humble Pie takes a while — a long while. Ticket times for normal-sized orders on both of my visits ran 45 to 55 minutes, so keep in mind that this is not a grab-and-go operation, despite what its carryout aesthetic suggests. Guests are advised to order before they pick up (delivery is available as well) or prepare to get comfy on that cozy patio. But it's fine. Whether you're bumbling around in search of the front door or lazing away in a patio chair waiting for the food, perseverance is key. 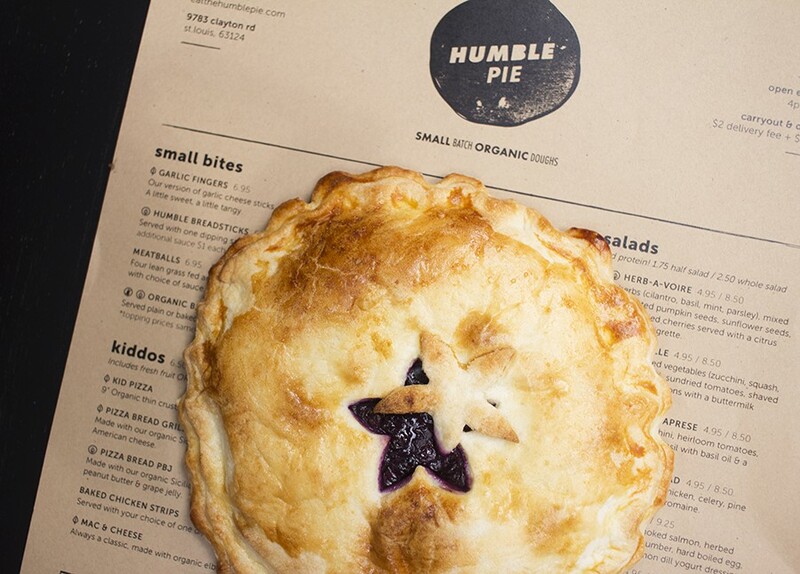 Once you get your order, Humble Pie proves it's worth the effort.